A-HOTEL.com - Luxury and cheap accommodation in Beketovka, Russia. Prices and hotel, apartment booking in Beketovka and surrounding. На Челюскинцев is located in Omsk, 4.1 km from Omsk Drama Theater and 4. Situated in Omsk, in a building dating from 2000, 5 km from Omsk Drama Theater, Hotel's compleks Mishel features barbecue facilities and guestrooms with free WiFi. Built in 2000, the property is within 6 km of The A. Featuring free Wi-Fi, a Finnish sauna and a Russian steam bath, the Zhar-Ptitsa is located within a 10-minute drive of the centre of Omsk. The spacious rooms at the Zhar-Ptitsa hotel are individually furnished and feature en suite bathrooms. 9 северная 99 offers accommodation in Omsk, 3 km from The A. Pushkin Omsk State Regional Research Library and 3. Set in Omsk, just 3.2 km from The A. Located 5 minutes’ drive from Omsk’s 18th-century fortress, this hotel offers air-conditioned rooms with a flat-screen TV and a fridge. There is also a 24-hour reception. Set in Omsk, 3.3 km from The M.
Just 1.3 km from The A.
Hostel Agat offers accommodation in the centre of Omsk. Guests can enjoy the on-site snack bar. 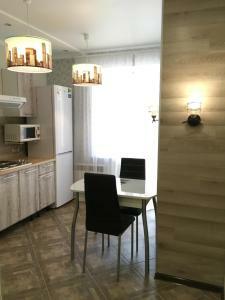 Alpha Apartments Omskaya provides accommodation with a kitchen, situated in Omsk. Free WiFi is offered. Apartments on Dachnaya offers accommodation in Omsk, 2.8 km from The A. Situated in Omsk in the Omsk region, Yutniye Metry u Pobedy has a balcony and city views. Guests may enjoy free WiFi. Куйбышева 27/6 offers accommodation in Omsk, 2.5 km from The M.
Apartament Berloga55 on 10 Let Oktiabria in Omsk provides accommodation with free WiFi, 3 km from The M.A.